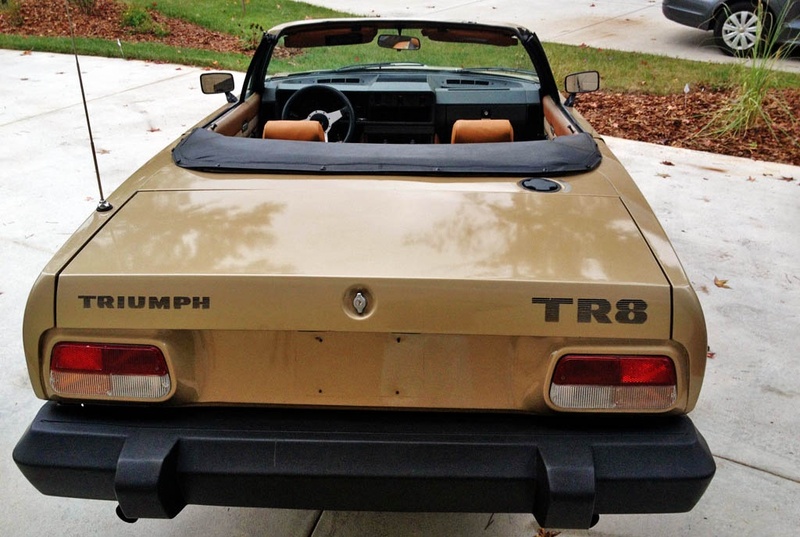 Ok, I admit it, as a past owner of a TR8 (and hopefully someday a future owner as well), I’m partial to the last Triumph TR. The Harris Mann-penned design has worn well through the years, and this convertible version found by reader Jim S promises lots of top-down fun in the future. Check out the eBay ad here for more details and to throw in a bid or two! Special thanks to Jim for this tip! When introduced in 1975, the TR7 represented an abrupt change for Triumph from the somewhat primitive TR6. 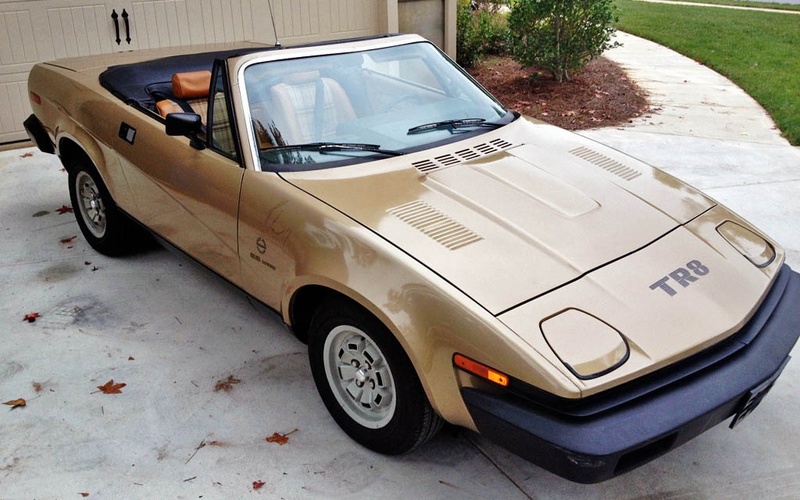 The TR7 was initially only available in coupe form in answer to threatened US regulations to outlaw convertibles, but the top came off the wedge design shortly thereafter. 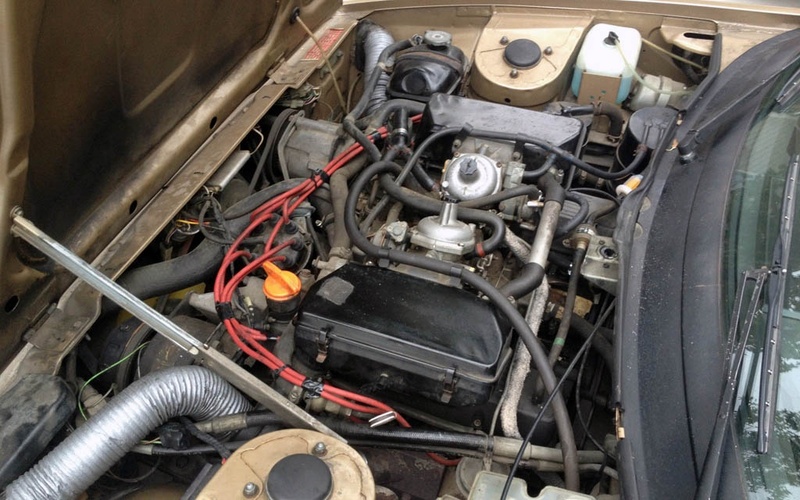 The TR7’s engine was not particularly powerful, and when a 16 valve variant using the Dolomite Sprint engine did not come to pass, British Leyland chose the American solution and installed the ex-GM Rover V8. The increase in power totally transformed the car (I’ve owned TR7’s as well) from a nice sports car into one that really goes, at least by the standards of the day. The TR8 is civilized as well; with the most watertight top I’ve ever experienced on a British roadster, air conditioning, comfortable seats and decent suspension travel, the TR8 really had everything going for it…except that Triumph was dying. 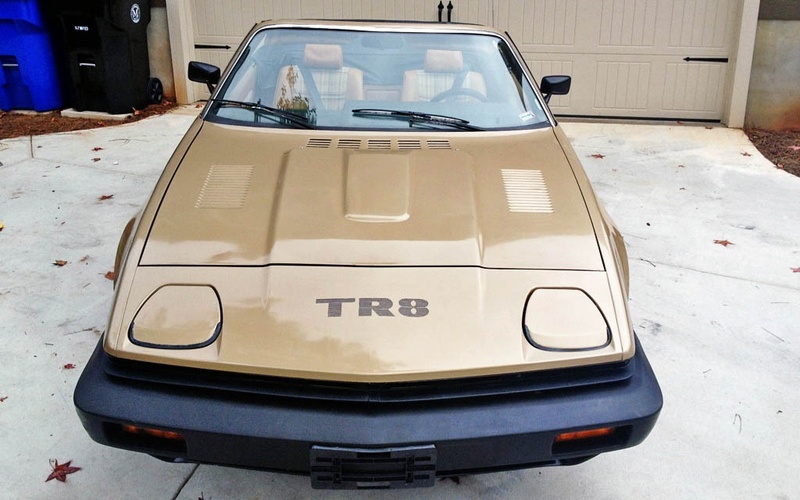 As the seller points out, less than 3,000 TR8’s were made before production stopped. It didn’t stop Triumph racers from winning many times with modified and showroom stock TR8’s, and it certainly doesn’t stop enthusiasts today, with the Triumph Wedge Owners Association a very active and helpful club. Cruising in a TR8 convertible on a summer afternoon with the decadence of having both the AC on and the top down is one of my fondest Triumph memories. This particular car looks like a very solid example, with zero rust according to the ad, although some touched-up scratches mar what looks to be original paint. Interior pictures look terrific, and are indicative of the less than 30k miles on the odometer. 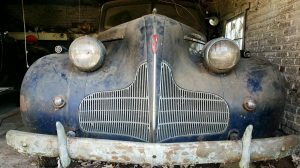 The seller explains that new tires, filters and rear brakes have been done but a new top is needed and the AC is inoperative. The power steering rack is a well-known weakness on these cars and the former source for rebuilding them doesn’t seem to be accepting new business. However, I know of at least one specialty shop working on a rebuild plan, and the online group of Wedge enthusiasts is extremely helpful, with a forum I’m still a member of despite selling my car last year. tr4 yes, tr6 of course, tr7 check but i did not even realize that bl even made a tr8. wish there was at least one side shot so i could (try to) appreciate the lines on this wedge. never really warmed up to the wedge shape but i have not seen one in so long it’s possible it may strike me different now. Huh? They didn’t make hardtop TR8’s…. Actually they did. The initial 1979 prototypes were all coupes with automatic transmissions. They continued to offer coupes through the end in 1981. This is wonderful although I think I could be in the minority here. Love it, especially the very 80s seats. Nice find Jim ! I love the interior as well! This is how the car should have been in 1976. Doh. 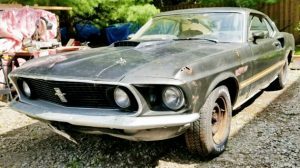 Seeing this ebay auction the other day, my first thought was: That’s a nice convertible in really good shape for not much money, and it has that great V8 with a 5-speed! I had driven a friend’s TR8, which was identical in every way to this car, back when these were still relatively new cars, and the drive was enjoyable. These are an affordable open car with an unusual drivetrain for a small Brit sportscar. On a nice summer day, which was when I drove it for a few hours, it sounded good and was very comfortable to be in. I just can’t feel OK with the body design, marketed by Triumph as “The shape of things to come” as Drew mentioned. It was more like “The shape that has come and gone”. These look very dated and awkward to me now, not vintage/appealing. The big V8 + 5-speed in a small car is a great recipe, but altho the engine sounds good it isn’t very highly tuned, so it ends up being disappointing. And IIRC these have a solid rear axle, which is a limitation. I had a first-year 240Z at the time that could run rings around the TR8….. But it’s really good to see such a nice TR8 with such low miles offered in a no-reserve auction. 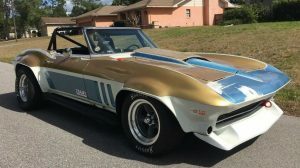 I even thought of bidding, but it’s certain that there are lots of people who appreciate this car more than I do, and I hope it goes to one of them. Well, I had a 1972 240Z and a brand new 1977 TR7 2.0 ltr 4 cylinder SOHC and believe me, the 240 was faster than the 4 cylinder TR7, it certainly wouldn’t run rings around it, let alone the 1980 TR8 I have now! 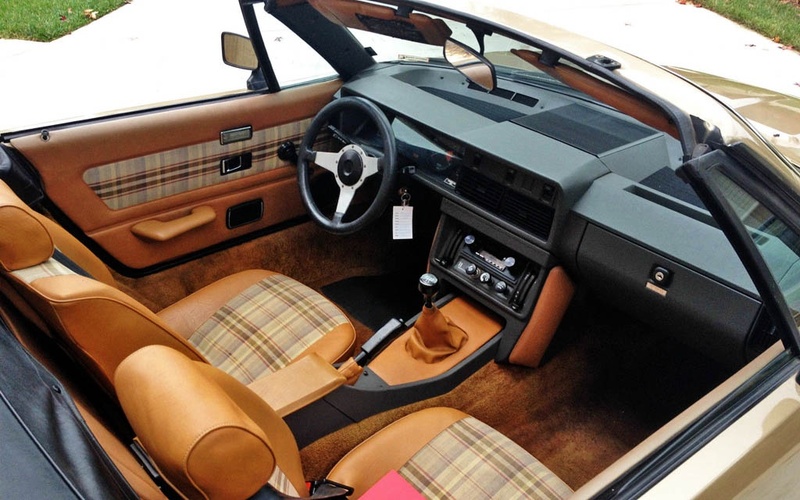 The TR7 and TR8 have a larger, more comfortable cabin and a better ride, too! I loved all three of those cars, but to characterize the 240Z as being able to run rings around a TR8 is just not true. I’ll take my current TR8 over any stock 240Z even a 300ZX! Besides, they’re cool and you don’t see anything like one one the road today! I’ve had six MGB’s and MGB-GT’s, 240Z, TR7, TR8 and even a 4 speed V12 XKE 2+2 and the TR8 is tied with the Jaguar as the most fun car I’ve ever had! They only made about 2700 of them and there’s only about 900 still on the road today! You can see the very first TR8 coupe in Pandora, Ohio, at TS Imports. 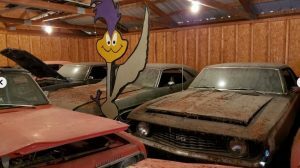 I was there this past spring and saw the historic car sitting in the “show room.” Very interesting and spent a fun afternoon talking with Ted Schumacher, the owner of the place and former British sports car racer. If you need anything for your British Leyland sports car, get in touch with Ted. He’s a great guy! Yes, they did make hardtop TR8’s, as a matter of fact all ~145 of the 1978 prototypes that were sold off in the US were hardtops. I used to own one. There were some production hardtops as well. Right, Jamie, and there’s a different brochure for each version. They have the same layout, showing the car in a dramatic overhead shot. A flap ‘opens’ to show the engine bay of each car. The convertible brochure shows a silver car, and the coupe brochure shows a red car. The convertible brochure appears on Ebay often, the coupe brochure in much rarer. I agree with Ricky – I love it too. These cars, to my eyes, don’t have nice lines in either hardtop (and there were TR8s in hardtop – I’ve seen a couple) or ‘roof-up’ configuration but with the top down and that Bui… ahem.. Rover V8.. they are good, retro fun. The performance isn’t there but they sound good and, if you wanted to, you could squeeze a lot more performance out of the engine with bolt-on parts but I doubt the rest of the car’s geometry would be up to it. Parts are relatively easy to come by these days, although you might be shipping the rarer pieces from the UK, but this is a very, very affordable classic. What do you think – $9 to $10k tops? Nice second car. Get a professional underseal and rust-proofing done on it, replace those dodgy Prince of Darkness electrical connectors and there’s no reason why it couldn’t run for another 30 years. Back here in the UK it’s a bit more of a minefield. The conversion of standard TR7s to TR8 spec was quite common, often a bit of a bodge by a home mechanic in a small garage, and it really is a case of buyer beware; more often than not a TR8 in Europe is not what it claims to be but I think you’ll have it easier in the USA. And I LOVE that interior! After my comment, to be sure my memory was not purple haze induced, here is an article from 1970. My cab must have been a prototype for the system. I can’t believe the price people want for these now. Unfortunately the TR7 will never be as desirable as the earlier TR’s, although the ‘genuine’ TR8’s are gaining in value. If I were going to spend nearly $10k on a TR8, I would definitely want the 1981 Injected one, and without the respray, ripped top and leaking steering. It may be original but is far from pristine or original. An earlier posters comments on power output are interesting. In the UK the ‘Rover 3 1/2’ engine is very well understood and supported and there are many many specialists who can extract large power outputs out of these engines. Just blueprinting and sorting out the ignition system can make huge gains. A former colleague of mine used to be able to get 500HP on pump gas (albeit at 5MPG!). I’d still like to buy Grinell TR8, with the door scallops removed and bumpers faired in better. That would be worth having. As a Brit you would think I’d like one of the last cars we built, sadly the whole black bumper look doesn’t work for me, it ruined the MGB, Triumph TR series cars and probably countless others. Export was a big thing for Great BRitan at the time and as such we had to comply with new regulations in the US of A (thanks you lot). If there is one thing I can say of the 8 is it carries off its lines better than the 7 though if it were my money I’d still invest in a 4-6 series TR. It’s interesting how when certain cars were not popular when they were new, even after 35 years, they aren’t worth whole lot of money when they are old. Here is a classic case. TR8s had a smooth engine, but not quite the power you might think. Off course they were somewhat heavy and didn’t handle particularly well. Repairs are pricey and the fact that a 4 cylinder TR7 is fairly worthless, does not help the TR8s value. If this car was pristine, it might be an easier sell. I’m sure it’s going to bring a lot more than the current price, but regardless, it will be quite affordable for someone who wants it.